On Saturday, 26th January, Australia Day, my family and I took a walk down to the beach, not to particularly see the thong challenge in action, since we thought it was all over by mid-morning. We knew that since it was Australia Day, the annual thong challenge would be happening as it has for the past few years, but thought that by heading down after midday, the event would have been over. Well we got down to the beach at around 12.15pm and discovered that the thong challenge was about to begin. We stopped to watch. 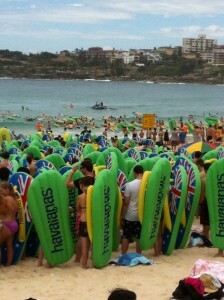 The water conditions were perfect for supporting 2000 or so participants to float out on their thong to try and break the world record. It was impressive to see how orderly these thongers were in the water and on the sand. Apparently the world record was not beaten however and Bondi only got to second place. 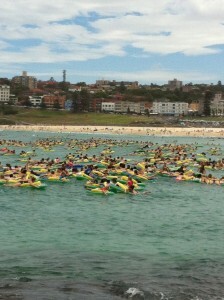 Cottesloe retained the world record for the highest number of people in the water on giant havaianas – only by 23 thongers! Just goes to show, that for all the hype and fame surrounding Bondi, more people participated in this Australia Day event in Cottesloe than they did in Bondi. I wonder what that says?